LONDON: England captain Alastair Cook insisted India batting great Sachin Tendulkar’s all-time record for Test runs had yet to come into his sights even though he had surpassed one mark set by the ‘Little Master’. Cook became the 12th player in history to score 10,000 Test runs during England’s nine-wicket win in the second Test against Sri Lanka at Durham to take an unassailable 2-0 lead in the threematch series ahead of the third Test at Lord’s. The left-handed opener was also the first Englishman to achieve the feat and, at 31 years and 157 days, the youngest to get to the landmark, breaking Tendulkar’s record by more than five months. Cook (10,042 runs in 128 Tests) is, however, nearly 6,000 runs short of retired star Tendulkar’s record aggregate of 15,921 runs from 200 Tests. The England skipper has 28 Test hundreds to his name, with his runs having come at an average of 47, whereas Tendulkar bowed out with a record 51 centuries at an average of nearly 54. 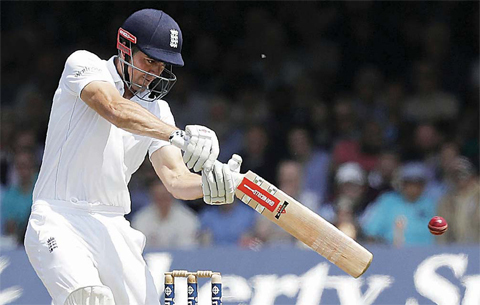 “Six thousand runs is a long way away,” Cook, speaking at Lord’s, said Wednesday. “It was set by an incredibly talented genius. I’m no genius and Tendulkar is, so that is a long way ahead. “I want to play for England for as long as I can and at the moment I’m really enjoying it. I am really motivated and hungry and where that takes me who knows.” Cook added: “I’ve never lived my life by saying where I want to get to publicly. “In private you have a few goals you want to try and achieve, but at the moment a lot of my goals are very immediate with this England team and as a captain that takes me away from personal milestones as a batter.” Nevertheless India hero Sunil Gavaskar, the first man to score 10,000 Test runs, said last week that Cook had it in him to set a new aggregate record for most Test runs because of his age and the fact that England play more games over the long format than many other nations. Following the Lord’s finale against Sri Lanka, England are then at home to Pakistan in a four-Test series. England will then tour Bangladesh and India, where they will play a total of seven Tests. None of those matches will be day/night contests. Australia and New Zealand broke new ground with a day/night Test at the Adelaide Oval late last year and Cricket Australia have now confirmed another such match against South Africa, also in Adelaide, for November. But with Ashes matches between England and Australia well supported, Cook said international cricket’s oldest rivalry could stick with traditional hours. “A lot of the games have really good attendances, and it’s probably not a series where you need to do it exactly at this time,” he explained. However, Cook also said: “My general view of day-night Tests is that they’re definitely something cricket authorities need to keep looking at-because it’s the way to keep the game moving with the times, making it more possible for spectators to come and watch. “My issue with it is the quality of the pink ball (used under lights because the standard red one is deemed too hard to sight).